Reviews of the Olympus E-5 from around the web. For the past couple of years, Olympus has focused mostly on its Micro Four Thirds line. But, as the new E-5 ($1,700, street, body only) shows, the company hasn’t forgotten about regular Four Thirds at all. The latest update of its flagship DSLR steps up to a 12.3MP Live MOS sensor (from 10.1MP in the E-3), adds a stop of sensitivity for a top of ISO 6400, and adds 1280x720-pixel 30-fps HD video capture. Meanwhile, it keeps the super-rugged magnesium-alloy body with weathersealing that is the top of its class. Here is the new flagship Four Thirds DSLR from Olympus, and depending on whether or not we believe the reports rampant on the web, possibly the last of the conventional models with mirror and pentaprism. Looking to the higher end of the amateur and the professional users, this new camera offers a host of features in a heavy and robust package, including a splashproof construction that suggests all-weather use. However, does the smaller sensor disadvantage the newcomer, or have Olympus indeed pulled a real winner out of the hat? Setting off into the rain and wind of winter, we shall see. 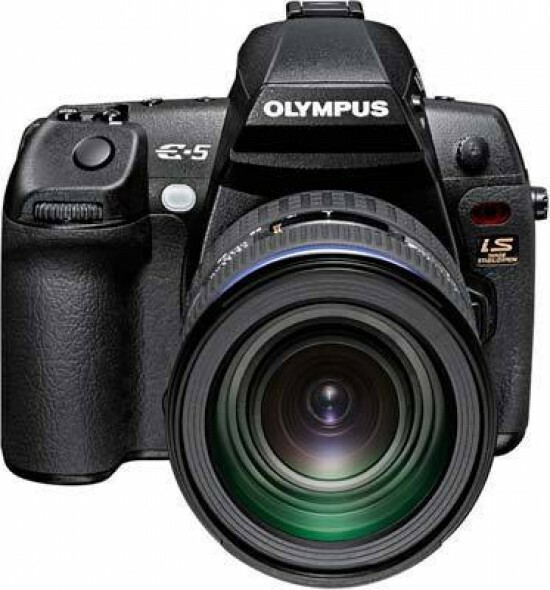 The Olympus E-5 is a very feature-rich DSLR aimed at professional users. This Four-Thirds camera is built around a 12 megapixels LiveMOS sensor capable of 5 FPS continuous shooting, ISO sensitivities up to 6400 and 720p HD video recording. Its built-in stabilization system claims up to 4 stops of advantage over hand-holding. These core features are packed in a large professional-grade body with dual-control dials, a 100% coverage viewfinder and top-notch weather-sealing. E-3 owners and Olympus fans will be glad to know that the E-5 is a highly capable and rugged imaging tool. Others may be put off by some of the limits of the comparitively smaller and lower-resolution sensor. As each new generation of DSLR cameras is introduced, we benefit from upgrades such as better sensors and processors, greater speed, superior quality, and extra features. All of that is certainly true of the new E-5. It replaces the E-3 and boasts higher (12 vs. 10 MP) resolution, superior image quality plus amenities originally developed for the mirrorless E-PL series of cameras. In fact, Olympus bills this new flagship model as offering the "reliability of an E-3 and the evolution of the PEN cameras" hinting that it's the best of both worlds.